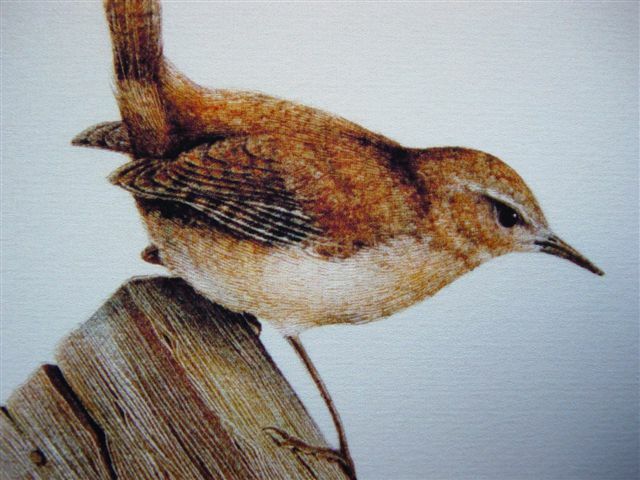 Wrens Larger Picture illustrates Nick's exquiste attention to detail. As a collector, and lover of wildlife you can imagine the passion Nicholas has for wildlife birds. When Nick first laid eyes on the amazingly intricate, and wonderfully constructed dome-shaped nests of these bold and active miniscule birds, Nick was inspired. The wonderfully loud song of this tiny bird is reassuring and comforting. It denotes the strength and perpetual desire of this wonderful little bird to survive in this sometimes difficult climate. The detailed image illustrates the artist's unique style and medium. This print is set on acid free mount on superb quality paper with fast inks to guarantee total colour strength for at least 80 years under normal conditions, measuring 15" by 12" (38cm by 30.5cm). All Nicholas Day prints are signed and numbered limited editions,a single edition is no higher than 50 this adds to lasting value of prints collected by this talented artist.